The painting of the Madonna in the Meadow (also called the Madonna Belvedere) was executed by a twenty-something Raphael while in Florence. The scene shows the Virgin with Christ and St. John the Baptist in a highly serene and tender moment against a landscape backdrop which places the scene in a Tuscan setting. In addition to being the cousin of Christ, St. John the Baptist was the patron of Florence, making his presence here in a Florentine setting very appropriate. The figures in the painting are arranged in a pyramidal composition. This is something that Raphael picked up from Leonardo, particularly his popular cartoon showing the Virgin, St. Anne, and their children, which was located in another church in Florence. Raphael also picked up on Leonardo’s use of fine chiaroscuro to model the figures so that they appear to take up actual space within the picture. Unlike Leonardo, however, Raphael used a lighter color palette that was more in keeping with the palette used by his teacher, Perugino. Raphael has used aerial perspective to show how the landscape is far away from us, the viewer. As we look back, we can see just how idyllic and peaceful the setting really is. The landscape in the background is filled with graceful curves, and this is connected to the figures through the Madonna’s neckline and shoulders, which also curve softly. Overall, both the physical setting and the subject matter are pleasant to look at. There is no pain, struggle, or even Leonardo’s mysterious tones present here. The only uneasy sign is the Christ Child grasping the cross of St. John, which is likely a means of foretelling the future Passion of Christ. The kind of peacefulness and harmony of the painting was held in high regard by Renaissance patrons, and after Raphael completed this work he would be asked to paint a fresco for an even more powerful patron – the pope – at the Vatican stanze in Rome. 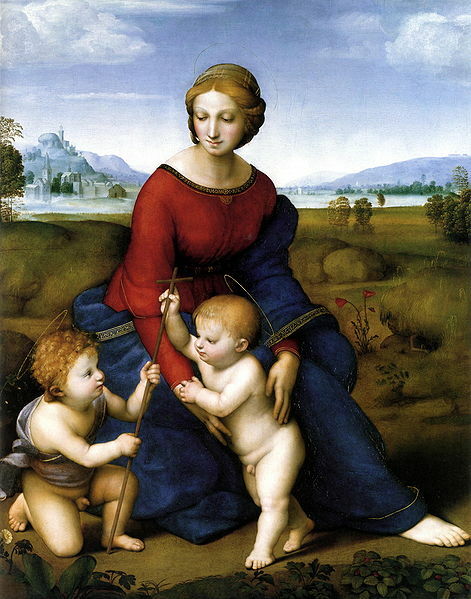 ItalianRenaissance.org, "Raphael’s Madonna in the Meadow," in ItalianRenaissance.org, July 20, 2012, http://www.italianrenaissance.org/raphaels-madonna-in-the-meadow/.